Copper pot with lid. It can hold “6 quarts,” which is marked on one side. Read more about meals and cooking - type 'cooking' or 'nutrition' into the search box to your left. What famous author is shown in a painting to be carrying a copper kettle? Check the Beaver Index - e.g., Trade Goods of 1748, by Arthur Woodward, December 1948. A variety of metal pots and kettles was used in the fur trade as an exchange item. They were generally made from copper or brass. Aboriginal people were quick to favour these new metal containers for cooking in place of their indigenous versions that were made from clay, animal hide or vegetal materials. For instance, metal pots were more durable and transported better than those made from clay. 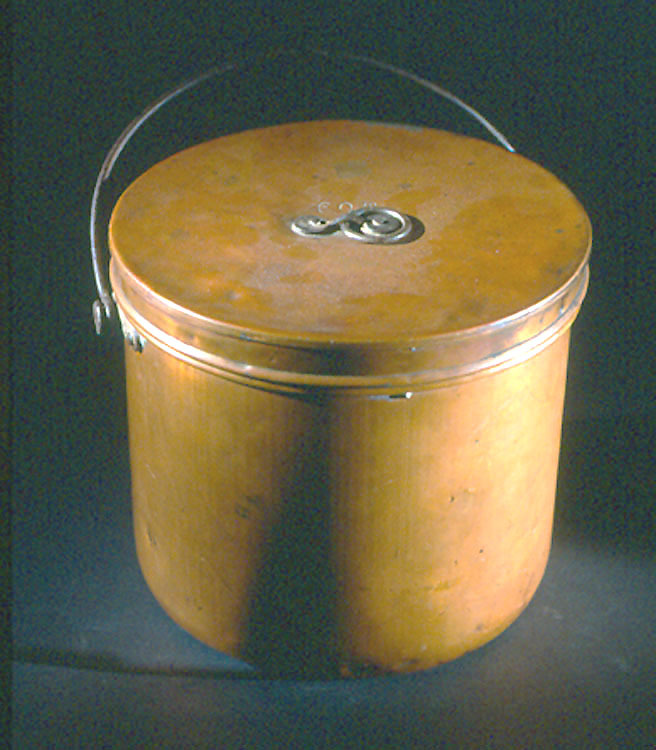 Metal containers with lids were imported to North America as early as the late 1700s and were essentially of the same type as the copper camp pots used by the military. This type became more popular than others because the lid permitted food to be cooked more quickly and kept the contents cleaner in the outdoors. They were traded by the Hudson’s Bay Company and were used well into the 20th century. A variety of sizes of pots was manufactured. At one site where a canoe had dumped its cargo overboard by accident, underwater archaeologists discovered a set consisting of 17 pots of various sizes nested into one another ranging from 16.5 cm in diameter to 43.2 cm in diameter. Pots were often transported in this fashion to save on space.